Just like the Nigerian flag, the Nigeria coat of arm is an official symbol of the West African country. A coat of arm is typically a heraldic symbol. It originated in ancient traditions of England and Scotland. The elements present in this symbol are signs of power and authority and passed down from one generation to the next. It is traditionally unique to an individual person, family, state, organization or corporation. The whole design usually consists of a crest and motto. Having been colonized by the British, it is no surprise the tradition rubbed off on the colonies even after their independence. The Nigerian coat of arm went through series of modifications before the current design which was finally adopted. The coat of arm is accorded the same respect as the Nigerian flag. 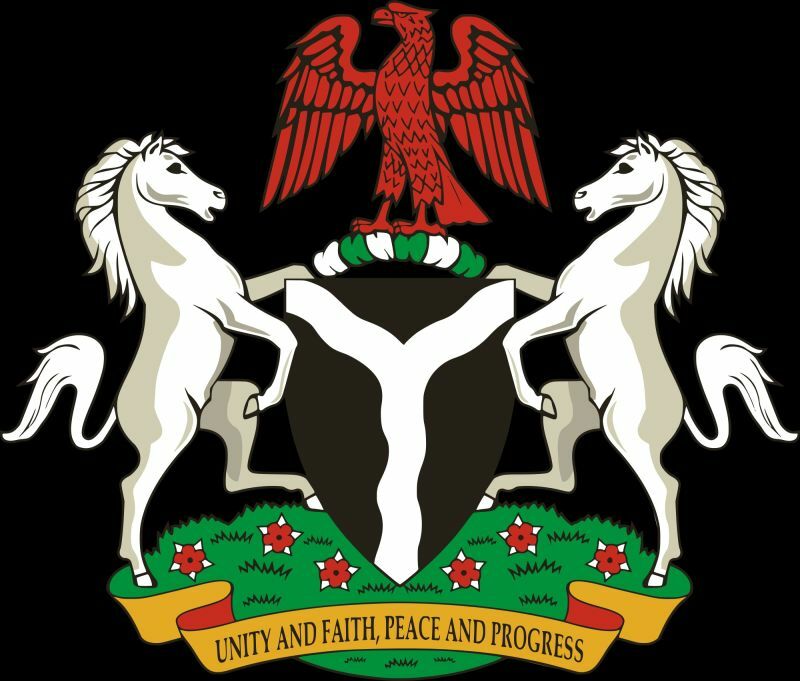 Under the Flags and Coat of Arms Act 1990, the law forbids the use or display of the Nigeria coat of arms other than in conformity with a license granted by a Minister of the Government or according to the law. It was created alongside the Nigerian flag and approved by Queen Elizabeth II on December 7, in 1971; by a Bahamian clergyman and artist identified as Rev. Dr Hervis L. Bain Jr. Another report says it was designed during the ascent to power of the military director, General Murtala Muhammed. The coat of arm has a black shield with two white lines that form a “Y” shape which is flanked by two white horses. On top of the black shield is a red coloured eagle with wings spread out and standing on a white and green wreath. Below the horses and the shield, is a green field and red and white coloured flowers. At the base is a golden band on which the nation’s motto was visibly written- “Unity And Faith, Peace And Progress”. The Nigeria coat of arm is one of the strongest symbols of the Nigerian authority. Though with slight colour variations, they are used as a stamp to the seal of the President, Vice President, House of the House of Representatives and the House of Senate. No document has officially been handed out by the government explaining the symbolic meanings of the several parts and colours of the coat of arm. However, the following are the generally perceived symbolic meaning of the coat of arm. There are seven permanent features of the coat of arms and each represents a virtue of the West African country. The Black Shield – This represents Nigerian’s fertile soil. The Eagle – The eagle at the top of the shield, standing on the Green and White band represent strength. The Red Flowers – The Red Flowers at the base are called costus spectabilis. This is known as the Nigerian national flower. This flower which grows in all parts of the country represents the beauty of Nigeria. The White Letter ”Y” – The white wavy bands in form of letter Y represents River Benue and River Niger which is the third largest river in Africa, after the Nile and the Congo-Chambesi. The two rivers meet at the confluence town, Lokoja. The Golden Band Around The Base – This carries the Nigerian National Motto since 1978 ”Unity and Faith, Peace and Progress”. The motto was formerly ”Peace, Unity, and Freedom”. The Two Horses – The horses on the side of the shield represent dignity. By the year 1960, the Northern, Western, Mid- Western and the Eastern region of Nigeria used a different coat of arms. With the creation of new states from the 4 regions under the administration of Lieutenant Col. Yakubu Gowon, the then Head of State, the Federal government put an end to the use of different coat of arms in 1975. Following that, a single coat of arm was adopted, which then served as a symbol of unity. At a time when there are many rising divisive factors in the country, it will be worth it to know the history of the country’s coat of arms.